Collins Bay Institution, established 1930. Photo credit: Parole Board of Canada. Pardons have been around for thousands of years. They're used in various forms by virtually every country on earth as a means of acknowledging that an offender has paid his or her debt to society, and should be fully welcomed back into the community fold without the ongoing stigma and legal limitations that accompany a criminal record. The record usually isn't erased, but it's segregated, and domestic legal restrictions accompanying a criminal conviction will often be lifted - although this won't address how other countries treat someone convicted of an offence. In Canada, it's the Parole Board of Canada who handles Pardon applications. The vast majority of people who submit the correct and complete paperwork get a Pardon after waiting the required period of time following the completion of their sentences - the more serious the offence, the longer the waiting period. 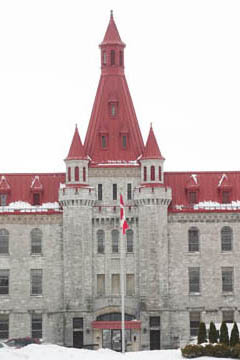 Until 1995 applying for a Pardon in Canada was free. Then a $50 cost recovery fee was imposed. Not too steep. Fifteen years later - in 2010 - it tripled to $150, supposedly reflecting the true cost of the process. Getting a little pricey for those of modest means, but hey, passport fees went up a lot as well. A whole year later, the government announced plans to more than quadruple the fee - to $631. More than a month's income for many of those stuck on welfare. The Parole Board of Canada launched a public consultation on the new fee. 1074 submissions were made opposing the fee. 12 supported it. A ratio of 90 to 1 against. Next, the Government of Canada's proposed Safe Streets and Communities Act which is currently before Parliament and would: (1) completely eliminate the word "pardon" and replace it with "record suspension"; (2) almost double the waiting periods after completion of sentence for making a pardon application; and (3) introduce a three strikes rule making people convicted a certain multiple offences completely ineligible for pardons. So what's someone who has been considering on and off over the last many years of applying for a pardon to think of all this? APPLY NOW. With waiting times for record request responses prior to being able to make your formal pardon submission, you might not be able to beat the changes in the system. But no dates have been set for any of the changes and the legislation hasn't even been passed by Parliament yet, so you have a good chance if you act now. Pardons will still exist later, but they won't be called Pardons, you will have to wait longer, it will cost you a lot more, and the rules might become increasingly difficult to comply with. There appears to be no Pardon for the Pardon. All three are completely viable options. Number three is definitely the cheapest. However there may not be a lot of cost difference between numbers one and two - don't assume lawyers will always be a lot more expensive. I assist people with their pardon applications, and my fees aren't a lot different than a pardon service. With a lawyer, in Canada you are guaranteed insurance and professional accreditation. If you decide to go with a pardon consultant service - and many people do - just make sure you check out their credentials. One consultant service I have heard good things about is The Commissionaires, which is largely staffed by former military and police personnel, and able to provide fingerprint as well as document preparation services. Be aware that not all of their offices offer fingerprint or pardon services. In Eastern Ontario, you need to deal with head offices in either Kingston or Ottawa. Whatever route you choose to pursue, I urge you not to wait any longer - just do it.